Tickets are still on sale for tomorrow’s (1/20) Kills show at the Riv. If you’re going, it goes without saying that you should get there early enough to witness the awesomeness that is Jeff the Brotherhood, but we’re also going to make an effort to catch first-opener Hunters from Brooklyn. More pictures from one of their hometown shows can be seen HERE. 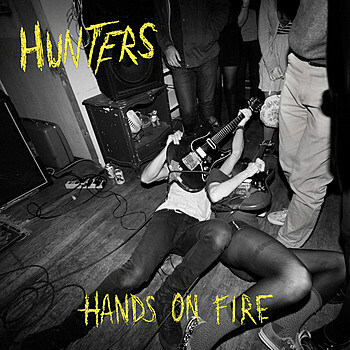 Listen to “Hands on Fire”, their recently released 5-song, James Iha-produced/Nick Zinner-mixed EP, at bandcamp. Tune in to their live Daytrotter session at 5pm today (1/19). Though we admittedly got confused ourselves, Hunters from Brooklyn are not to be confused with the Chicago metal band who are also named Hunters, and who just so happen to be playing Empty Bottle on Sunday (part of a four day tour with Antietam 1862 that starts today). Tickets are still on sale for the Empty Bottle show on Ticketweb (where you’ll also find links to the wrong Hunters, and a picture of the NY Hunters’ EP). More NY Hunters tour dates (aka Kills tour dates) HERE.